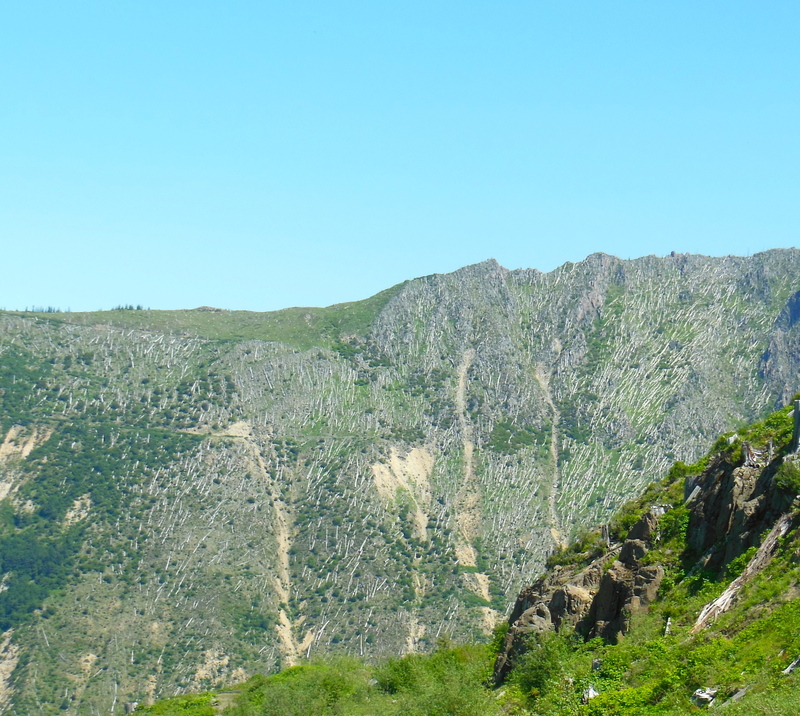 “The mountains are calling, and I must go” (John Muir). Snowline at Mt. Rainier is still at the Paradise parking lot; Mt. 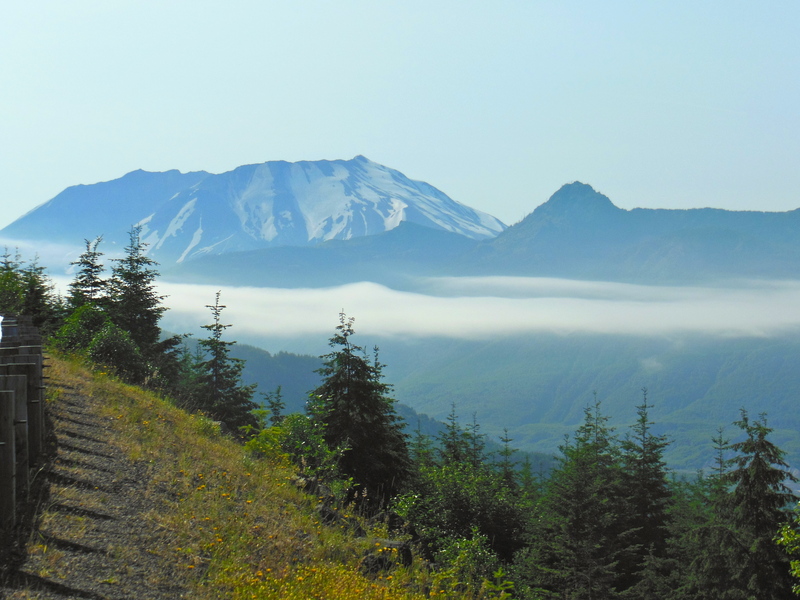 St. Helens’ Windy Ridge—on my summer 2013 list—is still closed by snow. So I choose the Coldwater Lake loop trail, on the warmer side of St. Helens, for my first Second Summer Exploration. 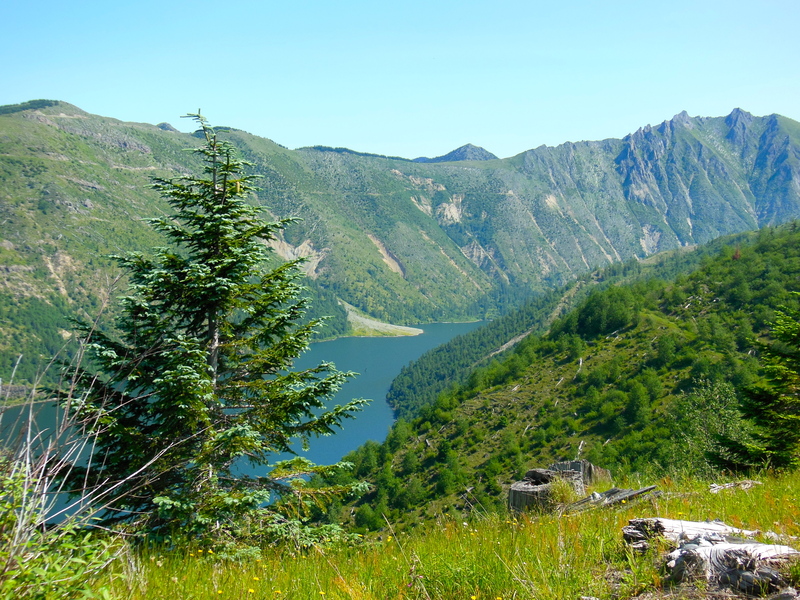 It’s a long hike, 12 miles, but how strenuous could a walk around a lake be? The temperature is forecast at 91 degrees. Seems excessive, but I am determined. Picking up my trip latte at 7:30, I head down I-5 to Castle Rock and leave the interstate. I stop at Silver Lake as mist hovers above the surface. 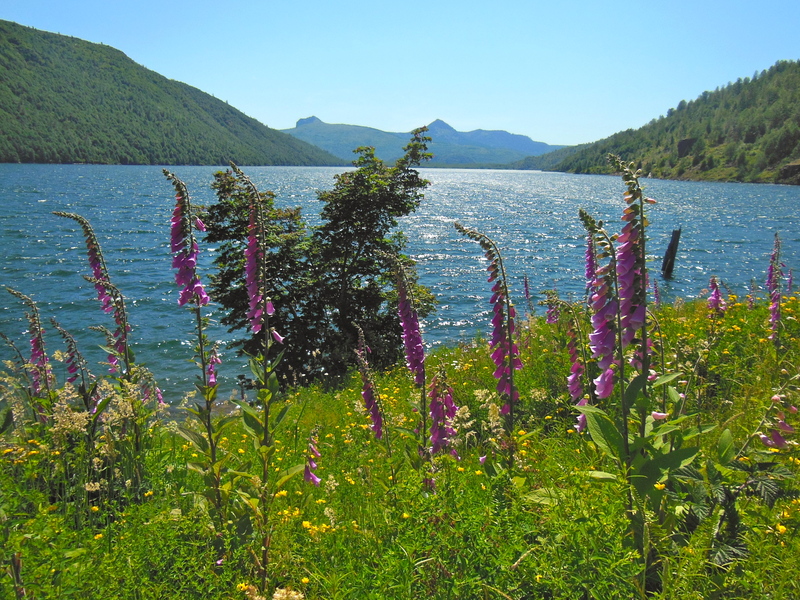 The lake, 40 miles from the mountain, was formed by a St. Helens’ eruption 2500 years ago. Coldwater Lake was formed 33 years ago. The ever-changing landscape. “Nature is never spent” (Gerard Manley Hopkins). I approach the blast zone as the cloud cover clears and the remains of the already-nearly-snowless mountain is revealed. After a quick stop at the boat launch bathroom, I drive the last mile to the trailhead. The upshit begins immediately, and continues relentlessly for nearly forever. It’s 10:00, already hot; my lungs burn and my heart pounds, my head is light. I didn’t expect tree cover, and am grateful for the surprise of it. I rest whenever there is shade, drinking water of which I fear there won’t be enough. Finally reaching the ridge, I look down to the left across the wildflower meadow onto the long sparkling lake; and into the gray yawn of the mountain’s crater to the right. The gradations of sky blue form a canopy, completing breathtaking grandeur. As I follow the ridge, I am in complete awe of nature. I grew up coming to this mountain with my family: picking huckleberries on the slope of the pumice-covered slope of the beautifully symmetrical mountain, camping and canoeing serene Spirit Lake; both appreciating and taking for granted the beauty of the place. And then, 1980, and in a flash it was forever changed. Trips into the blast zone when it opened were emotionally raw. Where it had been verdant green, the new landscape was gray. Hundreds of thousands of ghost tree trunks lay on gray ash like pickup sticks all facing the same direction—downward. In the entire blast area, there was not a single shred of green. A few years later, Weyerhaeuser-planted fir seedlings dotted the area and an occasional Indian paintbrush struggled up through the ash. So, so gradually the mountain struggled to return. And now? I am stunned. The trees soar. There are meadows of lupine, paintbrush, foxglove, gentian. The ghost trees can still be seen on steep distant slopes, reminders of the dense forest that was; but where I hike, most are invisible, buried under soil and vegetation. Even to the initiated, it looks like a mountain again. Except for the mountain herself. She will not regain her beauty in my lifetime. Lest I forget what happened here 33 years ago, I round a bend to the first of three enormous rusted and mangled pieces of heavy logging equipment tossed like Tonka toys from somewhere closer to the mountain and left where they landed. They take my breath away; eerie reminders of the force of nature. On hillsides beyond, dozens of gray stumps stand like grave markers to what went before: the lost lives of plants and animals, including 57 people. And then, the even more relentless descent back to lake level. My thighs are throbbing, and I won’t even mention my aching feet. Thank goodness for bunion pads. I left my Swiss army knockoff with the tiny scissors in the glove compartment and am grateful for the brilliance of whoever made moleskin tearable. I also repair a broken left shoelace that I should have known to have replaced after the right one broke two years ago on Mt. Rainier. I finally reach the valley floor, surviving the flies that, though annoying, seem sufficiently put off by my reapplied repellant. I am grateful for a post I read on the Washington Trail Association website, informing of three confusingly marked or unmarked forks in the road. I recognize each of them, and avoid the panic of not knowing which way to go. I will see no one during the entire seven hours it takes me to hike this trail. Getting lost would not be good. I did lose the trail crossing a talus field, but picked it up again on the other side. The trail crosses the tumbling Coldwater Creek that was damned downstream by a debris avalanche that formed the lake when the mountain’s north face collapsed. About a mile on through alder forests and wildflower meadows, past a beaver dam and a bald eagle roosting on a snag—representative of the return of wildlife—I reach a small beach and sit down on a drift log next to the lake. As the water gently laps the fine-sand shore, my hand rises unbidden to cover my mouth, as if to hold back the hiccup of my heart; but a sob escapes anyway. A tear rolls down my cheek as I acknowledge simultaneous profound sorrow at the loss of Spirit Lake and immense gratitude for this beautiful new one. Two generations of my family loved Spirit Lake, reduced to shadow before the oldest child in the next generation was a year old. My children and I did not recreate at Mt. St. Helens; but perhaps my children and grandchildren will again…at a different mountain and a different lake. It will not match my experience, but it will be theirs. Mt. St. Helens is a study in the opposite forces of Nature: evil and good; destruction and resurrection; decimation and rebirth. The Native American myths express this mountain as a hag who turned into a beautiful maiden. So, what happened? Was she raped or was it time to show her power? Was her beauty destroyed by violence against her; or did she tire of being young and beautiful and realize, finally, the power of the crone? For those of us who had the great good fortune to live in the Pacific Northwest before, during, and after the eruption—informed by experience rather than by displays in new visitor centers—Mt. St. Helens may be the most fascinating place on the planet. Gretchen, this is a keeper. Bob and I went to Mt. St. Helen’s with friends about a dozen years ago–one of the most amazing visits we’ve ever made. I couldn’t get over the already-beginning flourishing of trees, flowers, etc. As Gerard Manley Hopkins wrote, “Nature is never spent.” Indeed!